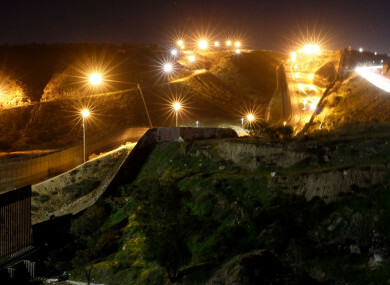 Floodlights from the US illuminate multiple border walls in Tijuana, Mexico. US PRESIDENT DONALD Trump has used a prime-time television address to insist he needs €5 billion for a steel wall along the Mexican border that he said would stop the shedding of “American blood” by illegal immigrants. Democrats are refusing to fund construction of the wall, a scenario which has led to a partial government shutdown. Democratic leader Nancy Pelosi said in her rebuttal speech that the real problem was Trump’s “cruel and counterproductive policies” making the border ever more dangerous for vulnerable migrants, including young families. We want to know what you think: Do you care if a wall is built along the US-Mexico border? Email “Poll: Do you care if a wall is built along the US-Mexico border?”. Feedback on “Poll: Do you care if a wall is built along the US-Mexico border?”.